These Certified Organic Essential oils are pure, unadulterated, and of the highest quality. They come from plants grown according to the organic criteria of authorities such as The Soil Association or COSMOS. Bay House Aromatics brand is now certified with the Soil Association and COSMOS to sell a range of Certified Organic Oils, Butters, Waxes and Cosmetic Ingredients. Many companies claim to sell Certified Organic Oils, but they are not registered to do so, and they do not display the recognised Organic Logo. 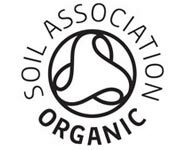 Be sure to look for the Soil Association or COSMOS logo on the bottle, if it is not there, then it can't be certified organic. !